For our first WNC CRAFT tour of the 2013 season, we were hosted by Walter, Wendy, and Andy Harrill of Imladris Farm in beautiful Fairview, NC. While Imladris is best known for their delectable jams and preserves, our tour topic was an “Introduction to Biochar.” The tour was a great kick-off to the CRAFT season as we learned about this innovative soil preparation technique and the potential benefits it has for mediating the affects of climate change via responsible farming! 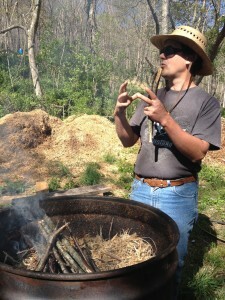 Our thanks again to the Harrill family for sharing their Biochar secrets and their warm welcome to their farm. Imladris Farm started twelve years ago when Wendy and Walter moved back to their family’s abandoned farm. Andy, their son, is the 7th generation living on the land! By growing what grows well in their microclimate, they produce blackberries, blueberries, and raspberries that they then make into jams and preserves. Additionally, they produce meat rabbits, and Andy is in charge of their flock of laying hens and egg sales. With hopes of seeing a batch of biochar made during the tour, we started around Walter’s biochar production site. But, as all farmers know, farming is a continual process of trial and error, and we were not able to get a good burn this time around. Walter was not deterred! He explained that making biochar is actually a farming tradition that has been practiced across the Americas for thousands of years, including in Western NC. Biochar is biomass that is burned to create charcoal and then used as a soil amendment to improve soil health. Each piece of biochar has ample amounts of surface area, creating habitat for microorganisms and soaking up nitrogen, minerals, and other soil nutrients like a sponge. In this way, biochar is able to hold these important elements in the soil for use by plants instead of their being washed away or leached from the soil and needing to be re-applied each year. Also, by sequestering carbon from the atmosphere in the soil for thousands of years, biochar can serve as a potential way for farmers to mediate climate change. At Imladris, they began making biochar three years agoas a way to make use of the raspberry canes they cut down at the end of each season. The biochar is made through a process called pyrolosis, which means the biomass, or the chipped raspberry canes in Walter’s case, are burned in the absence of oxygen, using extreme heat, so you’re left with useable charcoal, ready to be filled with nutrients and microorganisms. While there are several systems that can be used to make biochar, the Harrills use a Top-Lit Up Draft or TLUD system because it does not create as much methane as an open fire pit but is made with easy to find, inexpensive materials. Their TLUD burner consists of a 50 gallon oil barrel with about 40 holes drilled in the bottom. This barrel is then filled with chipped raspberry canes, and a small fire is built on top. Once the fire has caught, a lid with a chimney attachment is securely placed on top of the barrel. So, the fire burns from the top down toward the oxygen flowing in through the bottom of the barrel. If the burn goes as planned, the biomass is turned into biochar in about an hour. Then, you must work carefully but quickly, spraying the biochar with water to cool it down and squelch the fire so the biochar does not turn into ash. Typically, with this system, the return on biochar is 15% of the volume of a full 50 gallon barrel. Before biochar can be introduced to your fields, you first must “charge” it by mixing it with compost or manure, allowing nutrients, nitrogen, and microorganisms to take up residence in the sponge-like biochar. The Harrills accomplish this by spreading their biochar underneath their rabbit cages and leaving it there to mix with the rabbit manure for several months before applying it to the berry patches. Ideally, biochar represents 1-3% of your soil mix. While Walter has seen benefits from using biochar on his farm, he also reiterated that biochar is not their only tool but rather a way to make some nutrients in their soil last longer and make use of a waste product on their farm. So in other words, biochar is a great resource to add to your farm production methods, but it’s not a magic bullet! The Harrills were wonderful hosts and teachers, and there is just not enough room to include all the great farming insight and experiences they shared. We cannot thank them enough for starting off the CRAFT season with flare! 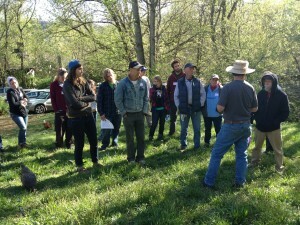 Our May CRAFT tour will be at Ivy Creek Family Farm led by Alex Hessler, Paul and Anna Litman. The tour topic will be a “Workshop in Soil Science.” Join us!! CRAFT is a year-round farmer training collaborative that offers farmers and their interns networking and learning opportunities. Membership is rolling, so join anytime! For more information or to join, click here. Or contact Cameron Farlow, OGS Farmer Programs Coordinator at 828.338.9465 or cameron@organicgrowersschool.org.